Course dates: Thu from 28 February (six-week course). 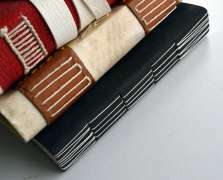 Learn a range of bookbinding techniques with Emma Fraser. Create beautiful, professionally finished books and pamphlets using only the simplest of hand-tools. You may want to use the course to create a special gift or album, or complete a special project. (Does not include hard-cover or repairs/restoration). For more information about this course, please check out B is for Bookbinding, our Q&A with tutor Emma Fraser.